Music – in all its different amalgamations of sound and silence – has the ability to transport and move us to new and previously undiscovered places. Turn on 'Live Or Let Die' by Paul McCartney to feel as invincible and classy as Roger Moore with a bourbon in hand, or shake it up with ''Come On Eileen' by Dexy’s Midnight Runners for a night of ill-footed Baby Houseman moves that will get you out of the corner. 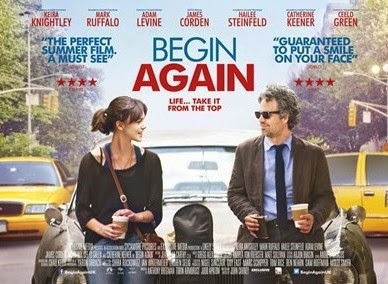 John Carney explores this notion in 'Begin Again', by asking viewers: can a song save your life? Stripping it down to its core, the film recounts the story of a group of people trying to mend broken connections and create new ones. Dan Mulligan (Mark Ruffalo), a dejected music-executive, is the depiction of an all-time low. Recently fired from his job and inadequately struggling to reconnect with his estranged wife (Catherine Keener) and teenage daughter (Hailee Steinfeld), it seems the only silver lining in his life is his Jaguar. On the other side, Greta (Keira Knightley) is mending a broken heart, left behind by her rock and roll boyfriend (Adam Levine) in a city of millions. However, in all their misery and solitude, these two lost stars manage to find each other and find a connection through music. It is with this shared passion that Dan and Greta set out to record an album all over New York City, while slowly piecing together the shattered pieces of their lives. As the story unfolds, music is layered into almost every inch of the screenplay, essentially becoming the protagonist. New York City becomes an instrument and the characters learn to largely communicate through pitch, rhythm and beat. Much to the audience’s delight, Knightley delivers these messages with sincerity and a newly discovered musical talent. However, while the music provides a vital and enriching element to the story, it also paves the way for a more superficial rendering of certain events. With the songs advancing the plot as much as the script, the film lacks a certain depth that remains camouflaged under the story’s upbeat melodies and uplifting messages. Putting aside the film’s shortage of complexity, it still manages to capture audiences through its quirky, feel-good moments that faintly resonate with anyone who has ever been alone in the city. As Dan and Greta use rock bottom as the solid foundation on which they rebuild their lives, they encourage viewers to discover the subtle beauty in life and believe that anything is within reach. While this whispered message may veer on idealistic, it underlines the importance of self-discovery as a tool to make you stronger than any of life’s externalities. 'Begin Again' effectively mixes film and music as John Carney drives emotion with song, ultimately letting delicate pleasures silently creep up on the audience. The film may not leave a profound mark on its viewers, but will undoubtedly leave them with a faint smile painted across their face, a renewed sense of hope, and a few whimsical melodies playing on repeat in their heads. Can a song save your life? I’m not convinced, but it most definitely makes the journey much more enjoyable. 'Begin Again' is opening in UK cinemas on Friday 11 July, through EntertainmentOne.